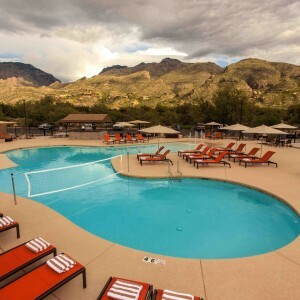 The Lodge at Ventana Golf & Racquet Club now has a new pool for members and guests. The Club’s members and management wanted to add a large, resort style pool that had recreation and relaxation as a main use. The existing pool at The Lodge is a lap pool that is used primarily for exercise, lessons and swim team practices. It is also used as a swim competitions site. 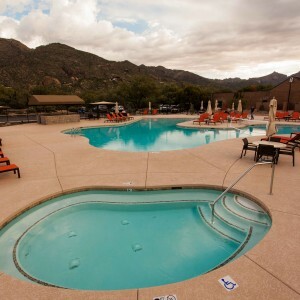 This new pool will offer more amenities for guests who choose the Lodge at Ventana as a premier vacation spot. The new pool, designed by Aqua Design International, has replaced two tennis courts and a parking lot so that both pools could be accessed within the same gates and make use of the existing locker rooms. It holds over 70,000 gallons, and has a sloped beach entry with spray jet fountains shooting water in the air. The jets creates a relaxing ambience of water noise but also as splash pad fun for children. There is a basket ball hoop and a volleyball net for more fun. There is also a large spa on site with plenty of jets for some hot water therapy and is in the midst of desert landscape. The pool and spa are surrounded by chaise lounges for sun bathing and large umbrellas for those that prefer shade. 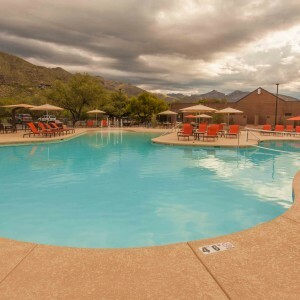 There are also shaded ramada’s for conversation pits and dining tables to sit and enjoy the offerings from the pool’s Snack Bar. Members and guests can also enjoy ping pong and Foose Ball tables on the lower level. The pool area was constructed by Cimarron Circle. The project started in March of 2015 and took 8 months to complete. The pool was opened for a private wedding party the first weekend in October and had a celebratory ribbon cutting ceremony complete with champagne to toast a beautiful project well done.